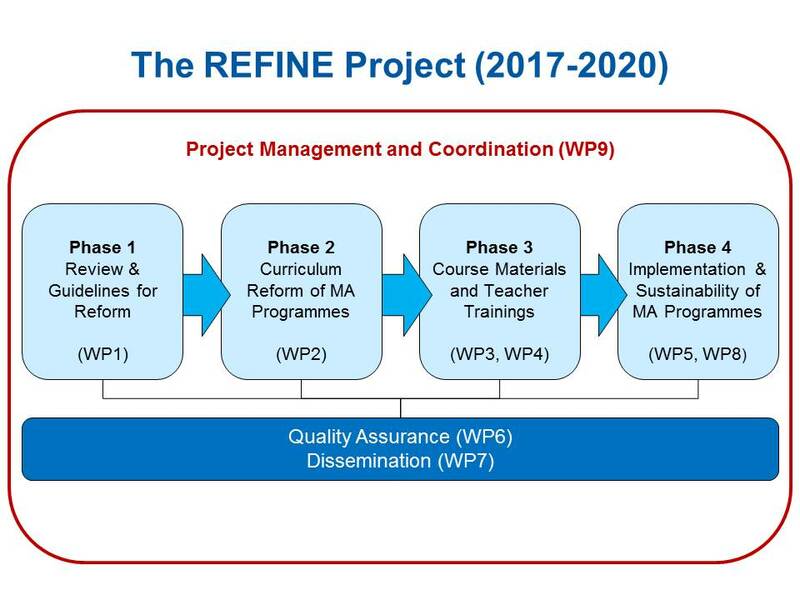 In a second phase the MA curricula in Finance at the Armenian and Moldovan higher education institutions (HEIs) will be reformed based on the outcomes of WP1. The curricula will be updated in line with the latest international developments in the subject area and the local labour market requirements (WP2). Additionally, learning outcomes and teaching methodologies will be revised. In a third phase existing course contents in Finance will be updated and new courses developed (WP3) based on the results of WP1 and WP2. Additionally, during this phase the EU HEIs will conduct two intensive training courses for 48 university teachers from Armenia and Moldova (WP4). These trainings focus on teaching methodologies/didactical approaches and relevant topics in Finance. In a fourth phase the consortium members in Armenia and Moldova start to implement the modernized MA programmes (WP5). The programmes will continue to run after the formal project end and a first wave of graduates will finish their studies during the summer term 2021. WP8 provides a sustainability strategy and follow-up cooperation agreements. To promote highest possible quality of the project outcomes / outputs all phases are accompanied by quality assurance measures (e.g. reviews by an external “International Advisory Board”). Moreover, to ensure a broad reach to relevant stakeholders all phases are accompanied by targeted dissemination and exploitation activities. This for example includes local dissemination workshops and two final exploitation conferences (in Chișinău and Yerevan) (WP7). Finally, all phases are tied together through on-going project management (WP9) and coordination by UAS-BFI and the WP leaders.